New papers on microbiology of the built environment, May 31, 2016 – microBEnet: the microbiology of the Built Environment network. Investigations in urban areas have just begun to explore how the indoor dust microbiome may affect the pathogenesis of asthma and allery. 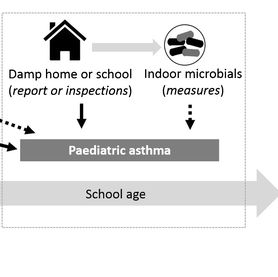 We aimed to investigate the early fungal and bacterial microbiome in house dust with allergic sensitization and wheezing later in childhood. Individual dust samples from 189 homes of the LISAplus birth cohort study were collected shortly after birth from living room floors and profiled for fungal and bacterial microbiome. (…) Logistic regression analyses revealed a significantly reduced risk of developing sensitization to aero-allergens at 6 years and ever wheezing until the age of 10 years for exposure to higher fungal diversity (…). The associations were attenuated for the longitudinal analyses (GEE) until the age of 10 years. There was no association between higher exposure to bacterial diversity and the tested health outcomes. Conclusion: Higher early exposure to fungal diversity might help to prevent from developing sensitization to aero-allergens in early childhood, but the reasons for attenuated effects in later childhood require further prospective studies. (…) Our aim was to characterize the bacterial and fungal microbiome in different types of environmental samples collected in studies of human health effects. 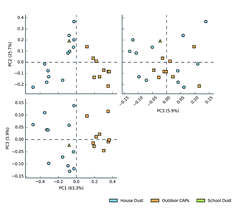 We determined the composition of microbial communities present in home, school and outdoor air samples by amplifying and sequencing regions of rRNA genes from bacteria (16S) and fungi (18S and ITS). (…) Sequencing of amplified 16S, 18S, and ITS regions was performed on the Roche-454 Life Sciences Titanium pyrosequencing platform. Indoor dust samples were dominated by Gram-positive bacteria (Firmicutes and Actinobacteria); the most abundant bacterial genera were those related to human flora (Streptococcus, Staphylococcus, Corynebacterium and Lactobacillus). Outdoor CAPs were dominated by Gram-negative Proteobacteria from water and soil sources, in particular the genera Acidovorax, and Brevundimonas (which were present at very low levels or entirely absent in indoor dust). 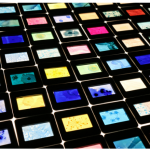 (…) ITS sequencing detected more than 70 fungal genera in indoor dust not observed by culture. Microbiome sequencing is feasible for different types of archived environmental samples (indoor dust, and low biomass air particulate samples), and offers the potential to study how whole communities of microbes (including unculturable taxa) influence human health. 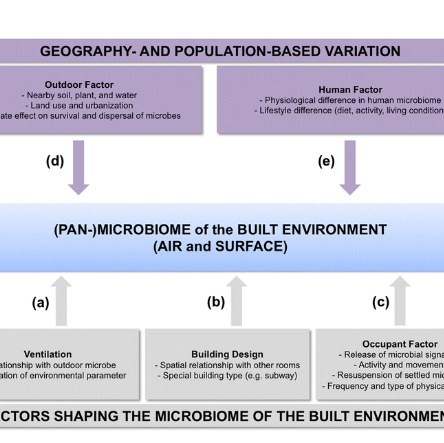 (…) In this review, we first provide an assessment on the roles of building and occupant properties on shaping the microbiome of the BE. This is then followed by a description of geographical variations in the microbiomes of the outdoors and humans, the two main sources of microbes in BEs. We present evidence of differences in microbiomes of BEs around the world, demonstrating the existence of a global pan-microbiome of the BE that is larger than the microbiome of any single indoor environment. 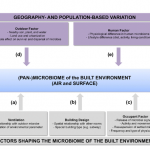 Finally, we discuss the significance of understanding the BE pan-microbiome and identifying universal and location-specific relationships between building and occupant characteristics and indoor microbiology. 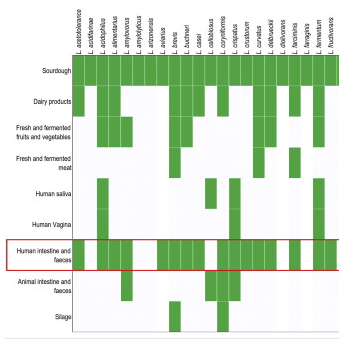 This review highlights the much needed efforts towards determining the pan-microbiome of the BE, thereby identifying general and location-specific links between the microbial communities of the outdoors, human, and BE ecosystems, ultimately improving the health, comfort, and productivity of occupants around the world. 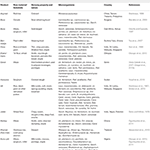 The global increase in the prevalence of asthma has been related to several risk factors; many of them linked to the “westernization” process and the characteristics of the indoor microbial environment during early life may play an important role. Living in moisture damaged homes contributes to the exacerbation and development of asthma. However, living in homes with a rich variety and high levels of microbes (e.g., traditional farming environments) may confer protection. 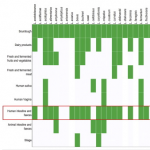 While the results of previous research are rather consistent when it comes to observation/report of indoor moisture damage or when comparing farming versus non-farming homes, when actual measures targeting indoor microbial exposure are included, the picture becomes less clear and the associations appear inconsistent. This may partly be due to limitations of sampling and measurement techniques that make comparisons difficult and provide an incomplete picture of the indoor microbial environment and in particular also human exposure. In this regard, new generation sequencing techniques represent a potential revolution in better understanding the impact of the indoor microbiome on human health. The etiology of IBD is unknown; current research is focused on determining environmental factors. One consideration is drinking water: water systems harbour a considerable diversity of microbes with bacterial concentrations estimated at 106-108 cells per liter. Perhaps differences in microbial ecology of water sources may impact on differential incidence rates of IBD. Regions of Manitoba were geographically mapped according to incidence rates of IBD and identified as high (HIA) or low (LIA) incidence areas. 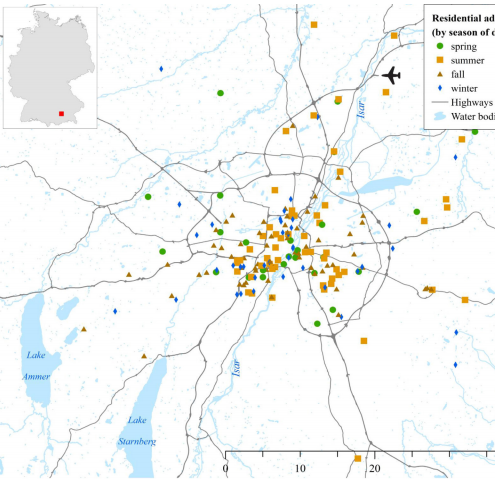 Bulk water, filter material and pipe wall samples were collected from public buildings in different jurisdictions and their population structure analyzed using 16S rDNA sequencing. 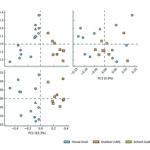 At the phylum level Proteobacteria were observed significantly less frequently (P=0.02) in HIA versus LIA. The abundance of Proteobacteria was also found to vary according to water treatment distribution networks. Gammaproteobacteria was the most abundant class of bacteria and was observed more frequently (P=0.006) in LIA. 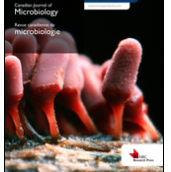 At the genus level, microbes found to associate with HIA include Bradyrhizobium (P=0.02) and Pseudomonas (P=0.02). Particular microbes were found to associate with LIA or HIA, based on sample location and/or type. This work lays out a basis for further studies exploring water as a potential environmental source for IBD triggers. Bacterial cellulose is a strong and ultrapure form of cellulose produced naturally by several species of the Acetobacteraceae. Its high strength, purity, and biocompatibility make it of great interest to materials science; however, precise control of its biosynthesis has remained a challenge for biotechnology. Here we isolate a strain of Komagataeibacter rhaeticus (K. rhaeticus iGEM) that can produce cellulose at high yields, grow in low-nitrogen conditions, and is highly resistant to toxic chemicals. We achieved external control over its bacterial cellulose production through development of a modular genetic toolkit that enables rational reprogramming of the cell. To further its use as an organism for biotechnology, we sequenced its genome and demonstrate genetic circuits that enable functionalization and patterning of heterologous gene expression within the cellulose matrix. This work lays the foundations for using genetic engineering to produce cellulose-based materials, with numerous applications in basic science, materials engineering, and biotechnology. 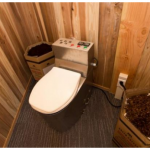 A brand new outdoor laboratory has been recently launched at UNIST (South Korea) and this is expected to convert human waste into renewable energy sources, and possible to a monetary value. (…) The major research facilities of this pavillion include “Waterless Energy-producing Toilet System” and “Microbial Energy Production System”. (…) To reduce the objection of using the facility, Prof. Cho and his project team added a unique artistic touch to this collaborative outdoor laboratory. They have designed a futuristic toilet with groundbreaking innovations in sanitation technology that is comfortable at the same time. A roof garden, which filters rainwater and provides insulation is another added value to this pavillion. Culturalable (sic!) and non-culturable microorganisms naturally ferment majority of global fermented foods and beverages. Traditional food fermentation represents an extremely valuable cultural heritage in most regions, and harbors a huge genetic potential of valuable but hitherto undiscovered strains. Holistic approaches for identification and complete profiling of both culturalable and non-culturable microorganisms in global fermented foods are of interest to food microbiologists. The application of culture-independent technique has thrown new light on the diversity of a number of hitherto unknown and non-cultural microorganisms in naturally fermented foods. Functional bacterial groups (“phylotypes”) may be reflected by their mRNA expression in a particular substrate and not by mere DNA-level detection. 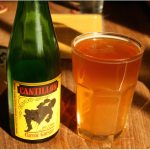 An attempt has been made to review the microbiology of some fermented foods and alcoholic beverages of the world. It was long ago determined that the species of yeast responsible for beer brewing was Saccharomyces cerevisiae. Around the turn of the century, we learned how to make that yeast on a large scale, leading to the growth of the commercial yeast industry. This made it easy to standardize the beer making process; brewers could ensure that beer would smell, look and taste the same every time that they made it. Today however, a growing group of brewers is going back to the source, harnessing the power of wild yeast to make their beer, leading to an array of flavors and an embrace of traditional brewing methods. Tal Danino grows various strains of bacteria into detailed, microscopic patterns that pull you in close. 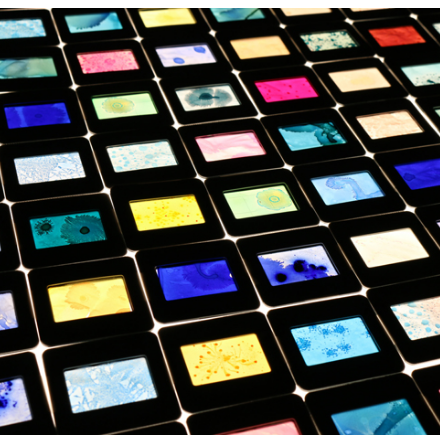 During a recent residency at Eyebeam in New York City, he researched how bacteria could be used as inks in various printing processes, like silkscreening or stamping. The resulting series of works, Microuniverses, is a marriage of nature and engineering–in the artist’s words, “you can control these patterns, but then they evolve on their own.” The concept of “controlling universes” is part of Danino’s day job. As the director of the Synthetic Biological Systems Laboratory at Columbia University, Danino is figuring out how to program bacteria so it can detect and treat diseases in our bodies.